Three years ago, I had my first ever panic attack. If you want the long story, you can read it all here. 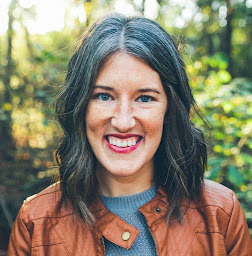 But the short story is that I had the panic attack, it continued for 5 straight days, I had a moment of revelation with the Lord and felt immediate physical relief, I continued my battle with anxiety, sought counseling, prayer, and anything else I could get my hands on, and am now in a completely different spot than I ever imagined I'd be in. Although going through all of that was truly awful, I'm better for it and I'm grateful to be able to empathize with others who are struggling. Before all of this, my perception of mental illness was completely inaccurate. It seemed weak and, honestly, just kind of silly. Why can't people just get a grip? I know that kind of perspective is shared among many people who have never experienced a mental illness or walked alongside someone who has. Sometimes it's because of a lack of compassion, but sometimes it's just because they don't know any better. Sure, we all deal with anxiety on some level. But when it stops your life, takes over your brain, causes you physical symptoms and pain, clouds your mind with fear ... that's when you know you have a problem that needs serious attention. That's a mental illness, not just a little case of worrying too much. By the grace of God, I am currently in a place where I don't deal with anxiety on a daily basis. It's very situational and even then, I feel capable of managing it and coping. Since I'm on the other side of it, I wanted to write out what I believe are the areas to examine and consider when overcoming anxiety. I'm not a doctor and I'm not a therapist, but I am a person who has been in the dark and come into the light. I am speaking from my personal experience. I would say that in most cases, there is a spiritual aspect involved with anxiety. I believe that a lot of the time, anxiety is our body's response to holding on too tightly to too much. That can mean a lot of things. We can hold on too tightly to our children, our husband, our future, our status, our job, our financial situation, a specific problem going on. You get the idea. From what I've seen and experienced, anxiety comes from a loss of control that we thought we had. But the reality is that the only control we really have in life is over our own decisions - our own responses to what life deals us. We cannot control the safety of our children or the security of our job or the outcome of the future. This is why it's so important to know where we place our trust. Now, one of the most frustrating things is when Christians think that a good sermon on worry or a list of bible verses will cure anxiety. It's just not true. So, while I am saying that there is a spiritual element that needs to be dealt with, it is not the quick fix for a mental illness. There is still plenty more that needs to be considered. In some cases, medicine is needed. All I will say about that is that even with a medication, I would strongly encourage you to still seek out counsel and help for the anxiety or depression or whatever mental illness you're struggling with. This is not something you want to let linger. Treating a mental illness solely with medication is only part of the process. You should dig deeper into it, whether that is alongside medication or not. Guarding our hearts is something we have to practice. It helps keep us from going back to that dark place. It's also a great preventative habit to start now even if you've never had serious issues with anxiety. An awful thought may come to mind, but we are in charge of whether or not we let it spin out of control into a completely false fear-based reality. We choose what we let into our minds and hearts. You get to choose what you think about each day. In my opinion, our society is pretty bad at this. It seems like we mope around as these weak mental beings. I just fell out of love with her and that's why I cheated. It's what comes naturally, so I did it. I need to do what's right for me and what feels good. That's just who I am and I can't change that. I'm not talking about being true to yourself versus being like someone else. I'm talking about fighting for what's right and best versus giving in to every little desire or fleeting thought we have. Take charge and push out the dark thoughts. So what does this look like? For me, it looked like stopping trails of fearful thoughts in my head and choosing to think about something else. It looked like focusing on exactly what I was doing at every single moment of the day instead of allowing anxiety of the future or "what ifs" to take over. It looked like choosing not to watch the news or other shows and movies that I knew would take my heart to a place it didn't need to be. It looked like getting up to do something different with my body if I felt the physical symptoms of anxiety start to rise up in my chest. Baby step by baby step, I replaced negative or fear-based thoughts with truth. Over time, all of those baby steps added up. If you suffer from anxiety (or any mental illness) and haven't sought any help, consider this your sign to get help. GET HELP. You can have the strongest support system around you and still need a professional counselor. 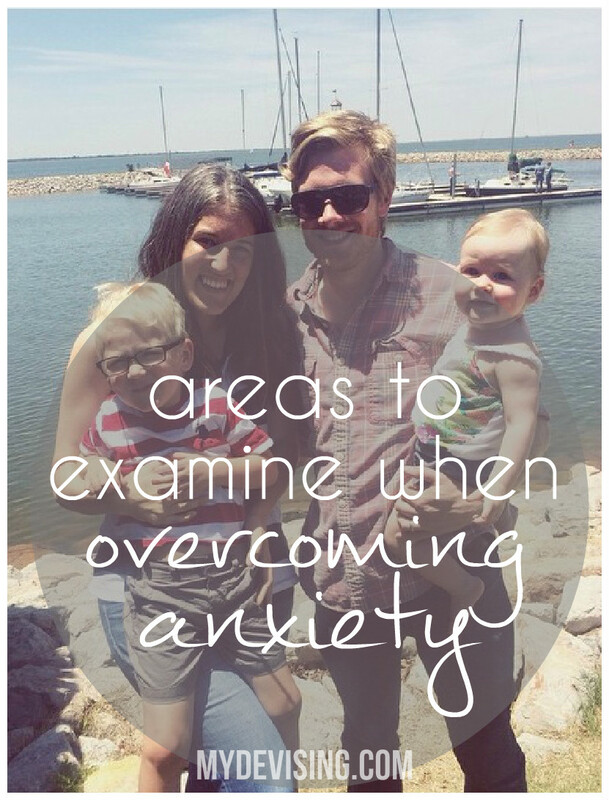 Everyone can benefit from counseling, but people who are weighed down by anxiety most definitely need it. You may not think it will really help you, but it will. You may be nervous about talking to a stranger, but I think you'll find it's easier than you imagined. You may worry that asking for help is a sign of your weakness, but it is in the weakest times that you are able to become who the Lord is making you to be. Do not put off getting help. You are valued, you are important, you are worth the money, you are worth finding childcare. It's critical that you talk to someone. When it comes to anxiety, I know I'm not alone. And if I thought I was alone when it was all happening, I quickly realized I wasn't as soon as I started sharing my story on my blog back in 2012. So many people deal with some sort of mental illness. Sometimes it's a lifelong struggle and sometimes it's situational. It looks different for all of us. But a lot of people are suffering mentally and you need to know you're not the only one. If you are feeling overwhelmed by any sort of mental illness, seek help immediately. You need people to walk through this with you. Know that you are not alone and that you can conquer. Yes, there may be a long, exhausting road ahead of you, but there is hope. There is light on the other side. Queria dizer-te que achei toda esta história muito, muito, inspiradora. Também sofro de ansiedade e sei disso desde que tive dois ataques de ansiedade sem saber, no momento, que os estava a ter. Tomei medicação durante uns meses e agora não tomo nada e não voltei a ter ataques, no entanto, ainda lido com a ansiedade. Concordo que temos que dar o nosso máximo para combater os nossos medos e os pensamentos mais negativos e substituí-los por coisas boas e é aqui que eu acho que encontro o meu equilíbrio. Apesar de todos os medos, de toda a ansiedade, eu sou uma pessoa que pensa positivo e isso também é uma parte muito importante. E também acho que a religião contribui muito para o nosso bem-estar.